Signup for our newsletter and get the latest within Playground Medic! Why be concerned about Playground Safety? Lack of proper supervision is a factor in 40% of all playground incidents. How do children get hurt on playgrounds? What are some of the common playground hazards? What can be done to make my child's playground safer? 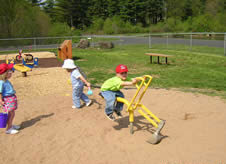 Have a playground Audit done by a NPSI Certified inspector. An Audit is a one time comprehensive evaluation of a playground and its environment and includes safety, compliance and accessibility. Identify and prioritize safety and compliance issues. Make arrangements for necessary repairs or replacement and put together a playground budget that includes inspection, repairs and maintenance. Develop a routine high frequency inspections procedure. A checklist for routine inspections can be derived from the Audit report. Train your staff to do a daily or weekly inspection and set the procedure to report needed maintenance or repairs. Have regular low frequency inspections. This type of inspection is done periodically by a NPSI Certified inspector. It is a more in-depth inspection than the high frequency inspection and identifies and prioritizes hazards. Keep good records. Files should be maintained for each playground that include the Audit report, layout, owner's manual, high and low frequency inspection reports, work orders, supply orders and any pertinent information on each playground's condition and maintenance. Having good records and procedures for inspection and maintenance is one of your best defenses in court. No matter how good your Plan is, it is possible that there will still be injuries as children often play in unanticipated ways. However, having a plan will make your playgrounds safer and, in case of an accident, this will provide a good defense if there should be litigation.